George Monbiot uncovers what many have suspected but few have been able to prove: that corporations have become so powerful they now threaten the foundations of democratic government. Many of the stories he recounts have never been told before, and they could scarcely be more embarrassing to a government that claims to act on behalf of all of us. Captive State is a devastating indictment of the corruption which which our political leaders have succumbed. 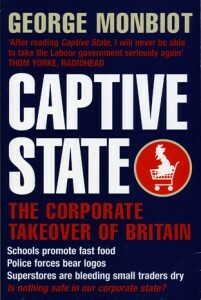 “After reading Captive State, I will never be able to take the Labour government seriously again.” Thom Yorke, lead singer of Radiohead. “Monbiot gives the green movement a glamour it has never previously enjoyed … the originality of his thought makes him uniquely influential.” Michael Gove, The Times.